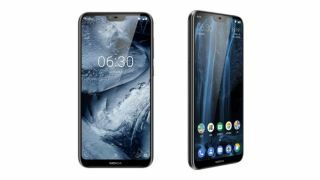 HMD Global has finally taken the wraps off the long-rumored Nokia X6 at a launch event in Beijing. The phone, which aims to offer mid-range specs in a premium-feeling body, will only be available in China initially, but it's expected to launch in other markets in the future. As various leaks had suggested, the X6 is the first Nokia device to get a notched screen. The phone follows the trend for less bezel and more screen, with the 19:9 display measuring 5.8 inches. This is also the first Nokia phone to feature the Snapdragon 636 chipset, which is coupled with 4GB or 6GB of RAM; the 4GB version comes with either 32GB or 64GB of internal storage, while the 6GB model comes with 64GB. The phone runs Android 8.1 Oreo, and has a 3060mAh battery and USB Type-C connectivity. There's a dual-camera setup on the rear – the primary camera is 16MP color sensor, while the secondary unit is a 5GB mono shooter, so it's a similar setup to what we've seen on phones such as the Huawei P20. The front-facing camera is a16MP with f/2.0 aperture and offers face-unlock capabilities. Camera software features include AI image enhancements and a HDR photo mode, and Nokia’s 'bothie' mode, which captures video from both the front- and rear-facing cameras at the same time, is here too. Going by the press images, the smartphone seems to have a smaller notch compared to the iPhone X, while it's similar to Apple's design in having curved edges and sides, with a glossy finish on the back. One the rear of the phone the two vertically stacked cameras are positioned centrally towards the top, with the fingerprint sensor below. The phone will arrive in White, Black and Blue color variants. Availability outside China is still unknown at the moment, but we can expect it to reach other markets where Nokia sells its phones. Pricing starts at CNY1,299 for the 4GB/32GB version, which coverts to a little over $200.